Special Safe-T-Edge: protects installers from sharp ends while it prevents cables from fraying. Wire mesh is smooth and round: to resist dirt and dust build-up. Standard 10' lengths: straight and easy to handle. 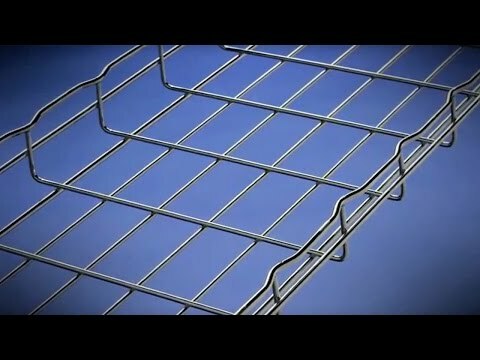 Large mesh size (2" wide by 4" long ): allows cable installers to route cables in and out at any point without cutting the tray. 1" to 6" high flange side of the tray: prevents cables from falling off. Dimensions are nominal: other sizes available on request. Available in the following finishes: Electro Zinc, Hot Dipped Galvanized, Stainless Steel 316L, Black Painted, and other Painted. Locking tabs help secure box to floor panel. This allows for quick and easy installation. Units can be prewired for power. Prewired units reduce labor costs for field installation. Large multi-compartment boxes. Provides adequate wiring capacity and easily isolates power and communication services. Boxes have several different depth profiles. These profiles allow the end-user to meet different raised floor depth requirements. Flexible box designs. Allow the end-user to configure services where they want and need them. Listed by Underwriters Laboratories Inc. to U.S. and Canadian safety standards. Meets NEC Section 300-22(C). The AC,AF, and SAF series are suitable for use in air handling spaces and raised floor plenums. Single and dual compartment low profile raceway design.Provides functionality and flexibility with aesthetics for single or dual service applications. Over-the-raceway box for 2300 and 2300D.Boxes mount over continuous run of raceway base eliminating the need to cut raceway when locating devices. Quick Fit integral faceplate.Provides flush look and ease of installation. Eliminates the need for additional commercial faceplates. Durable, textured PVC ivory or white finish.Blends with walls and ceilings. Consult factory for special colors. Datacom connectivity options.Accepts industry standard and proprietary devices from a wide range of manufacturers to provide a seamless and aesthetically pleasing interface for voice, data, audio, and video applications at the point of use. Accommodates communication and/or power wiring.Can be used for communications, computer lines, surveillance systems, fire alarms, outlets, and more. Lightweight and easy to handle.Saves time and labor costs. Standard 5' [1.525m] lengths can be easily installed by one person. Special lengths up to 10' [3.050m] are available. FiberReady divided fittings. For use with 2300 and 2300D. Full capacity, aesthetically pleasing fittings provide 2" [51mm] bend radius. Snap-on cover.Provides security with access to wiring for changes or additions. Easy to cut.Use a hacksaw or shears to cut raceway which speeds installation. Choice of raceway sizes with full line of fittings and accessories.Facilitates easy installation of wiring for whatever the job requires: communication devices, receptacles, switches, temperature controls, etc. Ratings:UL 600V (UL5A), CSA 300V (CSA 22.2 No. 62-93).